Wimbledon champion Roger Federer advanced to the Australian Open final today, turning his showdown with Juan Carlos Ferrero for the top ranking into a rout. Melbourne: Evergreen legend Martina Navratilova stayed alive in her quest for more glory as she teamed with Leander Paes to mowed down Jonathan Erlich and Liezel Huber 6-4, 6-4, reaching a second consecutive mixed doubles final today at the $ 14.5-million Australian Open. The high-profile pair will square off for the title against the unseeded Nenad Zimonjic of Serbia-Montenegro and Russian Elena Bovina. Match-winning leg-spinner Anil Kumble has had a glorious summer in Australia and he is keen to do his bit in the cricket tri-series finals against Australia as well but he appears to be racing against time. “There are limitations in my bowling. I am candid about it. With experience I have learned to bowl well within my limitations. It’s bit difficult to live up to the highest of expectations all the time,” says ANIL KUMBLE in an exclusive interview with Javagal Srinath. Captain Ricky Ponting will be taking a well-earned rest during the Perth one-dayer against India. He was not well when the tournament began, and it has been a hectic time for him, so he finally decided to recharge his batteries, before the finals, with a few days off. Adam Gilchrist will lead the side in his absence, while Simon Katich comes in to take his place. The winners of the fifth edition of the Asia Cup Women’s Hockey Championship, to be held at the Dhyan Chand National Stadium here from February 1 to 8, will qualify for the 2006 World Cup Hockey Championship to be held in Spain. 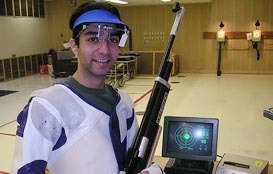 Indian Olympic hope Abhinav Bindra won the gold medal in the men’s 10m air rifle at the International Air Rifle and Pistol Shooting Championships held at Munich, Germany. Moving into the final in the seventh place yesterday with a score of 597, Bindra put in a superb performance in the title round to clinch the gold with a total of 701 points. Kila Raipur games, known as Rural Olympics across the country, appear to be jinxed with the rain lashing the venue since afternoon today, forcing the organisers to think about rescheduling the games. While the games were scheduled to start today on a grand scale, only a few events were organised because of heavy downpour. Punjab Police stroked out city rivals Punjab and Sind Bank (PSB), Jalandhar 10-9 in the sudden death tie-breaker to win the All-India DDA Invitational hockey tournament here today. Switzerland's Roger Federer falls to his knees as he celebrates his semifinal win over Spain's Juan Carlos Ferrero at the Australian Open in Melbourne on Friday. Wimbledon champion Roger Federer advanced to the Australian Open final today, turning his showdown with Juan Carlos Ferrero for the top ranking into a rout. In becoming the 23rd player to ascend to No. 1, Federer took control of the semifinal after fending off four break points while serving at 3-3 in the first set, rallying from 0-40. From 4-4, the 22-year-old Swiss, seeded second, won five straight games and eight of nine, and never gave Ferrero a chance to break again, winning 6-4, 6-1, 6-4 in just 1 hour, 29 minutes. No. 3 Ferrero, facing a seeded player for the first time in six matches while benefitting from a rash of upsets in his quarter of the draw, looked increasingly disconsolate as Federer ripped winners from the baseline and the net and kept him off-balance with a mix of spins with pinpoint placement. 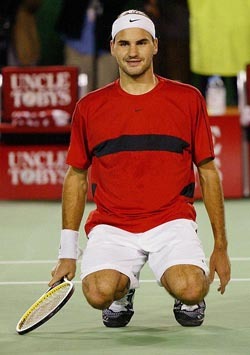 Federer had 11 aces and 34 winners, finishing off the match when Ferrero hit a serve return long. Federer will be seeking his second Grand Slam to go with his Wimbledon title when he faces former No. 1 Marat Safin in the Sunday’s final. 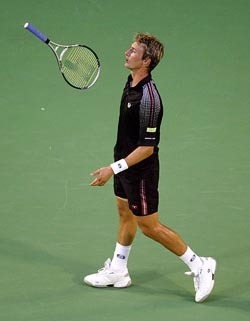 Safin has beaten US Open champion Andy Roddick - ranked No. 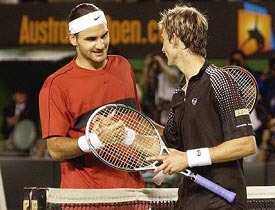 1 coming into the Australian Open - and defending champion Andre Agassi in his last two matches. Unseeded and ranked only 86th after an injury-plagued 2003, Safin could rise to 18th by beating Federer. Roddick will fall to third and Agassi one spot to fifth. Top-ranking is on the line in the women’s final tomorrow between No. 1-seeded Justine Henin-Hardenne, the reigning French and US Open titlist, and fellow Belgian Kim Clijsters. They have played 17 head-to-heads on tour, including eight times in 2003, with Clijsters holding an overall 9-8 edge. But Henin-Hardenne leads 2-0 in Grand Slam finals. Neither has lost a set in six matches. Clijsters, seeking her first title in a major, has been battling a sprained ankle and will be the crowd favourite as the fiancee of Australia’s Lleyton Hewitt. Top-seeded Virginia Ruano Pascual and Paola Suarez won their fifth Grand Slam women’s doubles title today, the first championship to be decided. It was the eighth straight Grand Slam doubles final for Ruano Pascual, a 30-year-old Spaniard, and Suarez, a 27-year-old Argentine. They had their serve broken only once, while serving for the match at 5-2, but rallied for their fourth break to finish off fourth-seeded Russians Svetlana Kuznetsova and Elena Likhovtseva 6-4, 6-3. Melbourne: Evergreen legend Martina Navratilova stayed alive in her quest for more glory as she teamed with Leander Paes to mowed down Jonathan Erlich and Liezel Huber 6-4, 6-4, reaching a second consecutive mixed doubles final today at the $ 14.5-million Australian Open. The high-profile pair will square off for the title against the unseeded Nenad Zimonjic of Serbia-Montenegro and Russian Elena Bovina. Those two advanced by putting out Argentine Martin Rodriguez and Italy’s Rita Grande 6-3, 7-6 (8-6). New Delhi: Promising youngster Karan Rastogi kept the Indian flag flying by booking a semi-final berth at the Australian Open junior tennis championships in Melbourne on Friday. Team physio Andrew Leipus, in his medical jargon, underplayed the extent of concern on Kumble’s fitness but manager Shivlal Yadav did not think the leg-spinner should be risked in the finals. “He needs rest and it is unlikely we would risk him in the finals in view of India’s coming engagements,” said Yadav in the nets today. Leipus expressed horror at the mention of “surgery” on Kumble’s famous shoulder but said “he is not going to play for now”. Leipus said Kumble’s right shoulder would prevent him from throwing in the field though he was absolutely fine and has no problem in bowling. Leipus said a scan had been done on Kumble which showed “small strain” in rotator cuff as well as soreness in the same area. “There are a couple of things going in there. We have had a scan done which shows a small strain in the rotator cuff as well as a chronic mild (soreness) in the same area which is because of the bowling he has done through the summer,” said Leipus. Leipus said Kumble hurt himself and was feeling weak after the Brisbane match against Australia on January 18. “He did knock himself down in the shoulder, he was complaining of pain and weakness after that Brisbane match. Kumble did take part in the nets today at WACA and though he did not bowl, he participated in the throwing session at stumps, preferring to hurl his returns underarm so as not to hurt his shoulder. Kumble was the stand-out bowler for India in the Tests, snarling 24 wickets in three games and all but won the series for the tourists. Also missing from the nets was vice-captain Rahul Dravid but it was not because of any fitness issue. Coach John Wright said Dravid said he tends to get dehydrated after he plays long innings and he was seeing a specialist in Perth who would advice him the right “fluids” to keep him going through long hours at crease. “Dravid has played a lot of long innings this summer and like it happens whenever he bats long, he gets dehydrated. He is seeing a specialist who would suggest him fluids (to battle through those periods),” said Wright. SRINATH: Congratulations for your great show in this series. How do you look at your future at the moment? KUMBLE: When I landed in Australia, I knew I might get limited opportunities. After all, the odds were against me. 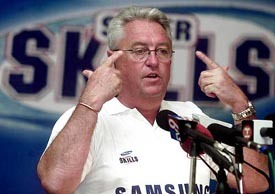 Some people questioned my selection in the team and my ability. I was realistic and simple in my thoughts and waited for the chance to come by. Bhajji was the automatic choice for the first Test and Murali Kartik would have played the second Test had he arrived in time. My five-wicket haul in the second Test gave me all the confidence I wanted. It’s good to be respected in the side but the fair bit of respect coming from the opponents was very crucial in my success here. This performance couldn’t have come at a better time especially in Test cricket. Although my priority is not only to play and win games for the country as long as possible but also to get closer to Kapil Dev’s record, which is a motivating factor. Having played with and admired Kapil, it will be truly exciting and equally challenging to get anywhere near his feat. SRINATH: It was heartening to see you make a brutally honest statement about your own records abroad. Do you think that had a moral effect on your bowling? KUMBLE: Although, I share the credit and discredit when we win and lose a match, there is belief in the hearts of the people that I am trying to win the match for my country. I take it as a big positive. There are limitations in my bowling. I am candid about it. With experience I have learned to bowl well within my limitations. It’s bit difficult to live up to the highest of expectations all the time. When we put big runs on the board, it gives enough opportunity to bowlers to derive the advantage. That’s what happened in this series. Every time our batsmen batted, they scored more than 400 runs and we, the bowlers, thrived on it. SRINATH: The biggest disappointment or I would call it a bane for the Indian cricket is that sometimes our predecessors criticise our cricketers too much. It creates havoc in the mind of our youngsters. What do you think of it? KUMBLE: It is definitely disappointing to hear the destructive criticism that our younger lot goes through. No cricketer can become a great player in a couple of series. It takes a few years for any cricketer to be labelled as good or great. You are always better than the last game when you learn from your mistakes. When the team is good, the youngsters will have to match the talent and perform at par with the standards set by the seniors. It is never easy for a rookie straight away. We have tremendous talent that need proper fostering. 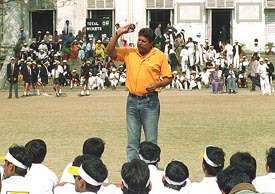 Unfair criticism coming from some of our own past cricketers can play havoc on the young minds. Self-doubting could be the biggest block in development of anybody’s career. While the so-called experts express their own opinion, the youngsters should learn to take the criticism and the adulation in the same stride. SRINATH: Your father’s death during the Indian series, followed by you being left out of the playing eleven and off course the family life you constantly miss out. All these things must have had a bearing on your mind for sure. KUMBLE: Things have changed since my injury and my own role in the side has also gone through a change. During those 12 months, I pondered over my cricket, my alternative career and my family. My Dad would have been really pleased with the way the things have gone for my team and me now. My father always encouraged me to do well. That’s what life is all about. Personally, the World Cup was disappointing but the team did a wonderful job. I was too keen to do well and play a big role in there, as I knew I wouldn’t figure in the next World Cup team. I did contemplate seriously about my cricket life after the World Cup. During that hard times, my wife Chetana, who is in the family way at the moment, stood like a rock beside me. She and my family are the pillars of my life. During my long absences because of my national team commitment, my family always bears the burden of handling the day-to-day activity, which is tough on them too. SRINATH: It’s wonderful to see the younger spinners like Harbhajan, Joshi, Kartik or even for a while Raju looked up to you to discuss, learn and share their concern. But I don’t think you had anyone like that helping you all through your career? KUMBLE: In my case, things were different as my bowling style is unique. May be if BS Chandrashekar hadn’t met with that unfortunate accident, I would have shared his knowledge. After all, there are some similarities in our bowling style. In a way I am disappointed because not too many people came forward to tell me what was going wrong when I struggled at times. Some of them were ever ready to find my faults, but nobody really came forward with a solution. I did try meeting VV Kumar to see if I can change my style to orthodox leg spin bowling, but somehow it didn’t work out for me. Finally I decided to stick to my own style and add a few more variations into my framework of bowling. My only help were my teammates and the videos. Captain Ricky Ponting will be taking a well-earned rest during the Perth one-dayer against India. He was not well when the tournament began, and it has been a hectic time for him, so he finally decided to recharge his batteries, before the finals, with a few days off. Adam Gilchrist will lead the side in his absence, while Simon Katich comes in to take his place. The other change, this time forced by injury, is the inclusion of Michael Hussey. He replaces Michael Bevan who has fractured his rib. As far as the pace bowlers are concerned, WACA wicket generally has all of us lining up to bowl. Though the wicket has slowed down a bit over the last couple of years, it still has enough bounce and carry to excite pace bowlers the world over. Having said that, there is a good chance that I might get a game off. I don’t really want it, but the physio and team management will have the last word on the issue. The last game against India will remain with me for a long time to come. I had changed my grip at the start of the domestic season, and the change was working because I got a couple of 50s for New South Wales. During that last over from Balaji, plenty of thoughts were flooding my mind: should I back my strength and hit straight or should I just try for twos and threes till the last ball. With eight required from the last three balls, I suddenly decided to go back to my old grip. When the ball was bowled I swung, shut my eyes, and prayed. What followed was an unreal feeling, because this was the first time I had turned things round in the last over with my bat. During the VB Series last year, I had taken the last four wickets when England needed 14 runs at a run a ball. My last-over six now ranks right up there with that spell, among my best memories in one-day cricket. Looking ahead, the Perth game is being viewed as a crucial one by our side since we would like to carry on building momentum till the finals come. It has been a tough month for me since I lost my grandmother and then we all were gutted by the news of David Hookes’ passing away. Cricket kept my mind away from these setbacks, and right now I feel I am getting back to my top pace. It would be great to bowl at Perth since I know that if I bowl straight and fast, I will do well. The rained off game in Melbourne gave all the bowlers a chance to get some rest, so I’m actually feeling pretty fresh right now. However, it’s upto the captain and management. Indian Women’s Hockey Federation (IWHF) president Mrs Vidya Stokes said here today that the stage had been set for the prestigious event, which India would be hosting for the second consecutive time. India had hosted the fourth edition at the very same National Stadium in 1999, when the hosts finished runners-up to champions Korea. Korea had been winning the title for the past three editions held at Hong Kong (1989), Hiroshima (1993) and Delhi (1999). 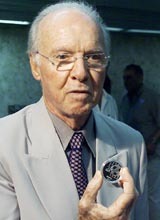 The inaugural edition was held in Seoul in 1985. India had won the bronze at Hiroshima and finished fourth at Hong Kong, besides taking the silver in New Delhi. Mrs Stokes announced that India would also be hosting the fourth Junior Asia Cup Women’s Hockey Championship in Hyderabad in September-October this year. India will clash against Malaysia in the fourth and last match on the opening day on February 1. Singapore will meet Japan in the opening match. There will be four matches every day, two each in groups A and B. All the matches will begin in the morning. There will be two rest days on February 3 and February 5. The final will be played on February 8 at 1.30 pm. During the Asia Cup, India will also host the Asian Regions High Performance Coaching Course from February 1 to 6. Several Indian international players and coaches like Rupa Saini, Pargat Singh, M P Ganesh, Ramandeep Singh, S.S. Walia and C.S. Poonacha will be attending the course in which six foreign coaches and four obserservers will also be participating. Ms Stepheanie Hodges is the tournament director. Indian Olympic hope Abhinav Bindra won the gold medal in the men’s 10m air rifle at the International Air Rifle and Pistol Shooting Championships held at Munich, Germany. Moving into the final in the seventh place yesterday with a score of 597, Bindra put in a superb performance in the title round to clinch the gold with a total of 701 points. The silver medal went to Ryan Tanoue of the USA who ended on 700.8 and the bronze to Molobovahu of Romania (700), the National Rifle Association of India said in a press release here today. Rain and windy conditions failed to dampen the spirits of the participants. Though a large number of spectators turned out at Grewal Stadium in the morning with the hope to witness some exciting events, heavy rains just before noon threw all the arrangements out of gear. Mr A A Siddiqui, Director-General of Police, Punjab, who was scheduled to declare the festival open formally at 3 pm, too, could not come to the venue as the organisers had conveyed to him that no event was possible because of the wet outfield. Mr Sukhbir Singh Grewal, chief organiser of this festival, informed that they had not yet decided to reschedule or extend the sports since two more days are left. A decision in this regard, would be taken after seeing the weather conditions tomorrow. Braving the rain, Maghar Singh, a nihang from the Damdami Taksal who has been a regular participant in this festival for the last 20 years exhibited a rare performance. He kept the balance while riding two horses simultaneously. He took four rounds of the ground and received applause from the audience. Three heats were conducted in bullock cart races in which, Gurjant Singh (Lalton), Harwant Singh (Aasi Kalan), Bagga Singh (Sai Mahal), Parmider Singh (Gujjarwal), Bubbly (Lalton Kalan) and Bahadur Singh (Lohgarh) advanced into the final. In hockey (junior), SAI, Patiala outplayed Ropar Hawks 2-1 and Kila Raipur beat Haryana XI 3-0. In Air Rifle shooting (men)- Gurdeep Singh ( Phillaur), Davinder Singh (PAP, Jalandhar) and Mohinder Pal Singh of PAP, Jalandhar secured first three positions while in the women’s section, Shelly, Amitinder Kaur and Ramandeep Kaur (Master Tara Singh Memorial College) earned first three spots. In the Air Pistol event (men) Gurdeep Singh, Dashpreet and Gurinderjit Singh finished first, second and third respectively. In the women’s section, Pawandeep Kaur, Rajbir Kaur and Manjeet Kaur of MTSC, Ludhiana got medals. It was sweet revange for the police men, who had lost to PSB in the finals of the DCM tournament at Kota last week. In a lacklustre summit clash played under inclement weather the two teams failed to produce their best. The movement of the ball was hampered due to waterlogging of the turf for most part of the game. Even though the bankmen appeared to have a better gameplan, their thrust was blunted due to excessive moisture on the turf. DAV College, Jalandhar, in the men’s section and BBK DAV College, Amritsar, in the women’s category won Guru Nanak Dev University Inter-College Squash Raquet Championship that concluded at Service Club here today. DAV College captured first position by defeating local Hindu College 2-0, Lyallpur Khalsa College stood third. In the eve’s section, BBK DAV College routed Lyallpur Khalsa College, Jalandhar 3-1. Sarabjeet, Mansi and Manjinder of BBK DAV College beat Vijata, Suneeta and Sukhpreet of Lyallpur Khalsa College with the score of 2-0 each, respectively.